The Galle Chandelier, which has a goldfish-less bowl in its bottom, is on display for the next year. The Galle Chandelier, styled after a whimsical hot-air balloon, is on display at The Getty Center through April 19, 2020. You're going to make sure it turns on without too much bother, and flicks off as easily. You'll want to know the sort of bulb it takes, and whether a new shade is required. And finding a table for it? You probably have one in mind. Though many people have shopped for a light source at least a few times in their lives, they've likely never loaded a large, hot air balloon-style chandelier into the trunk of their car, a chandelier that requires eighteen candles. Oh, and water to hold a goldfish. But if surreal sources of historic illumination are your particular bag, you're probably familiar with The Galle Chandelier, which just went on display at The Getty Center. 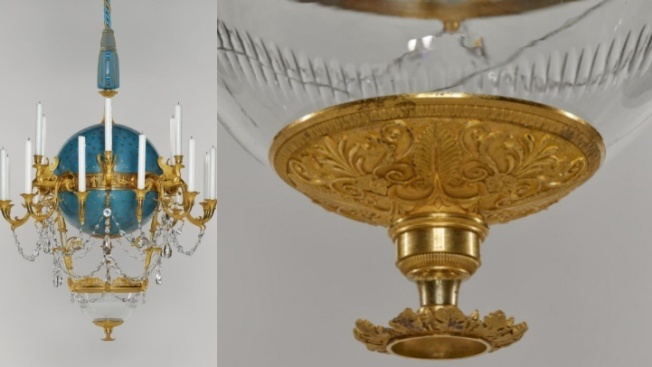 The remarkable utilitarian artwork, which hails from 1818-1819, was created by Gérard Jean Galle, a gifted gilder and bronze caster who referred to his gilt-laden light source as a "lustré a poisson" or "fish chandelier." There's no current fish making its fancy home in the now-waterless bowl, which sits at the bottom of the chandelier, but a host of other haute details may be admired. Like? Well, the chandelier really does look like a hot air balloon, but one that possesses nods to the four elements, as well as the zodiac signs and pretty stars, too. It's a chandelier that might make the everyday lamps standing in the corners of our own dens feel slightly ho-hum. Hailed as "one of the Getty's most beloved objects," the chandelier was removed from display for conservation work earlier in 2019. It is now back on view, at eye level, for a full year to come, starring in its own splendid show. Perhaps you've spied this whimsical piece before — it has been on exhibit at the museum since the center's 1997 debut — but, if not, this is a prime time to spend some quality moments in its regal presence. "Flight of Fancy: The Galle Chandelier" may be seen at the art-famous destination through April 19, 2020. Admission to The Getty Center is, as always, free, while parking is additional.